After spending a week vacationing with my family and friends in Kona, a week of snorkleing, body surfing and basically relaxing, Will and I had to get to work for another week on the Island. I had arranged to meet up with my good friend Jeff Krieger for some big game fishing based out of his families properties on the island. Jeff’s family has a home that has been in the family for many years and the pictures on the wall told stories of Jeff’s youth growing up and fishing on the island. 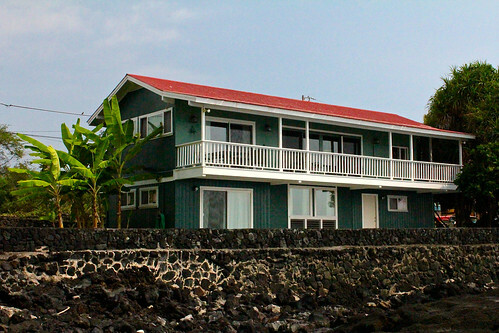 They also own a second home which is available as a vacation rental home. The Kriegers house we stayed at was right on the water across from Captain Cooks monument and a short paddle to the blue water. Most of the days were pretty overcast with a couple days of rain and wind. We fished for 6 days and most of those days were nice and calm with good numbers of fish. We landed a lot of small tuna but also lost a lot of them to the ever present Oceanic Whitetip sharks. That was one of our biggest battles, getting our baits or fish past the sharks. Would have loved to fish light tackle on the tuna but that just meant an easy meal for the sharks, so I stuck with my Okuma Cedros or Makaira lever drag and would just crank the fish in as fast as I could. I did end up hooking one of the sharks and had a real fun fight on him, it was at least 200 pounds. Once up near the kayak I just locked up the drag and broke it off. 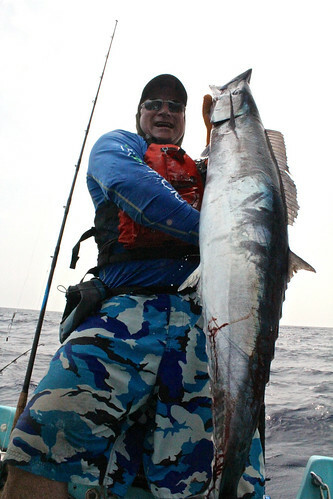 The highlight of the trip would have to be Jeff’s Wahoo/Ono. I had loaned him my Cedros ld with a megabait and he made a drop right next to a buoy and got slammed and was off to the races. Wahoo are just a mouth full of teeth and he was lucky from start to finish, the lure stuck outside the fishes mouth away from the teeth. Once he had the fish close a shark decided he wanted it and Jeff literally pulled this awesome fish from the sharks teeth, leaving just a few cuts down its tail. Jeff was lucky that I had some heavy Seaguar leader on there which was easier to crab, but also even more lucky that when the fish landed in his kayak the didn’t get filleted by the teeth. 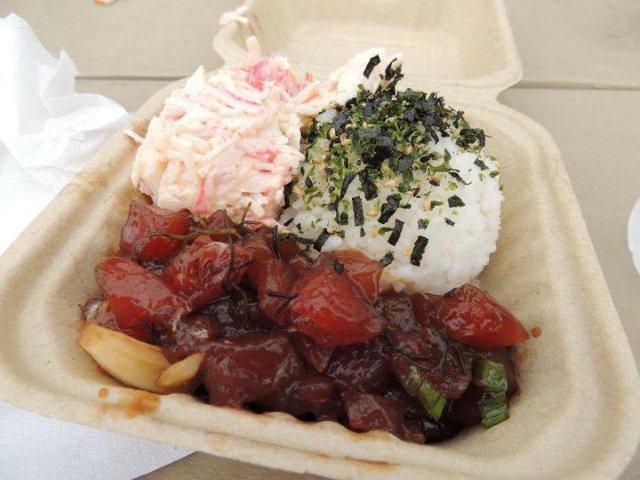 In Hawaiian Ono means delicious, and it sure was, we feasted on that forty pound fish, seared, poke style and as sashimi. We also did some jigging inshore near the rocks, which I love but only came up with some real small, yet beautiful reef fish. Another great trip that I am sure will make for a couple awesome episodes. Please thank our sponsors for their support. All the Okuma gear worked to perfection, we were very happy with the new ExO neck gators, those really helped keep us cool. 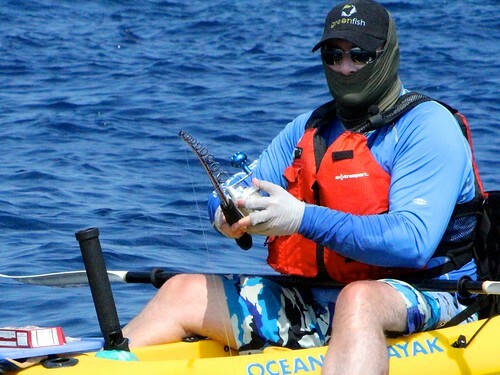 Maui Jim as always protected our eyes but also made seeing those sharks under the kayaks easy. The new Delorme GPS and Inreach combo is so cool we are already getting great comments from people following us on the trips, can’t wait to use it on the next trip to Baja. 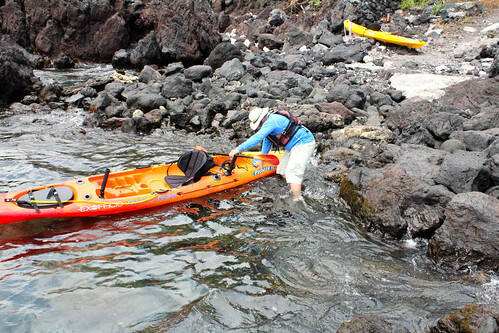 I loved the new Body Glove 3T shoes not just on the kayaks but for climbing on the lava rocks. Another great trip in the books, See you at ICAST, then off to Mexico to shoot our next episodes. 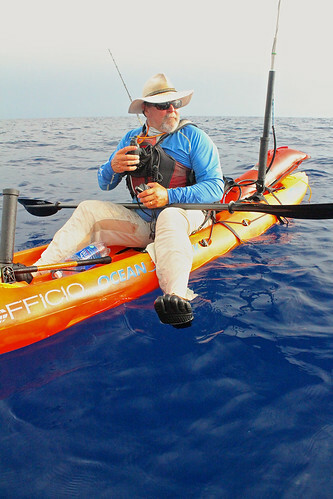 I really enjoyed reading about your kayak fishing trip in Kona. I happen to be on vacation in Kona for another two days and was wondering if you might be able to connect me with any of the local fisherman that you know. I’m specifically interested in Kayak fishing. Man that looks like a lot of fun… Will have to get out of Arizona and make it to some saltwater fishing one of these days! That is a bucket list trip for sure ! ! 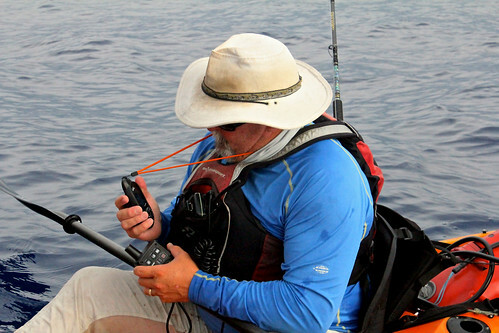 Great photos on your kayak fishing trip in Kona. The photo of the 40 pound fish is neat, that is one BIG fish. He was lucky to keep it and the shark did not take it for his dinner.